Veggie chips, granola bars, fat-free frozen yogurt — we know plenty of so-called healthy snacks are basically junk food in disguise. But diet soda, in all its fizzy glory, seems like it should be a real-deal “free” food. After all, how can you go wrong with zero calories? “When you drink diet soda, you’re not taking in any calories — but you’re not swallowing anything that does your body any good, either,” explains Ashvini Mashru, R.D. and owner of Wellness Nutrition Concepts, LLC. Not only can diet soda sabotage your weight-loss efforts, it may also set you up for health risks down the road. 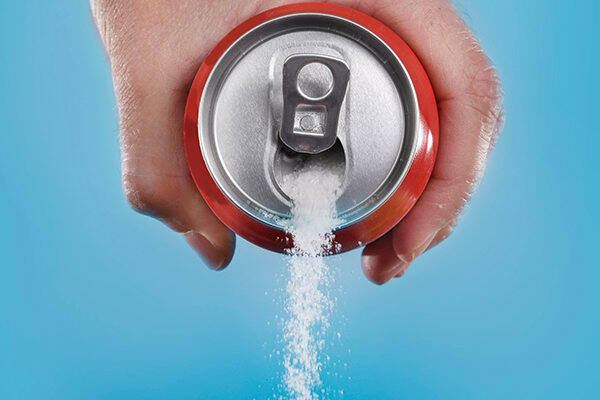 Chances are, your dentist wouldn’t approve of your diet soda habit. They may be sugar-free, but their high acidity can still lead to tooth erosion. In fact, according to a case study published in General Dentistry, the tooth erosion caused by frequent diet soda consumption was comparable to the erosion caused by a crack cocaine or methamphetamine addiction. “Zero calories don’t have zero impact when it comes to weight,” Mashru cautions. Researchers at the University of Texas Health Science Center at San Antonio speculate that artificial sweeteners could be “fueling — rather than fighting — our escalating obesity epidemic” after finding that a three-a-day diet soda habit is associated with an almost-doubled risk of being overweight or obese. It’s counterintuitive, but diet drinks may actually cause your waistline to expand. A study found that the waist circumference of daily diet soda drinkers increased by an average of 1.83 inches — more than double the increase of those who didn’t drink diet soda. It may seem like the perfect drink mixer when you’re watching your calories, but it may affect how your body breaks down alcohol. A 2013 study found that participants who mixed alcohol with diet soda had a higher breath alcohol concentration than those who mixed it with regular soda. Diet might seem like a better substitute for a regular soda, but a 2009 study suggests that people who drink diet soda every day had a 67 percent greater risk of developing type 2 diabetes. So it should still be treated as a cheat meal and consumed in moderation.